After five years of either creeping out, intriguing or delighting travelers, the “Devil Horse” of Denver International Airport, as some critics call it, is getting a new round of attention, but it looks like it's going to stay. Behold "Blue Mustang," a 32-foot, 9,000-pound, electric blue, anatomically correct fiberglass sculpture of a rearing horse situated along Peña Boulevard, the main road to the airport. 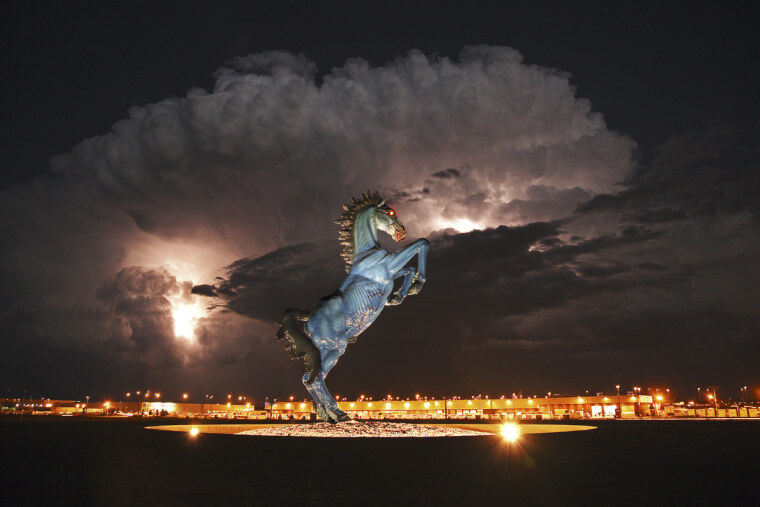 Its fierce looks and glowing red eyes have earned it nicknames such as "Blucifer," "Satan's Steed" and "Blue Stallion of Death.” Luis Jiménez, the artist who created it, died when a piece of the sculpture fell on his leg and severed an artery, adding to the exhibit’s eerie status. Comments left on Denver International’s Facebook page have called it everything from “a hideous embarrassment” to “horrible, and a bit sick.” But other posters have called it “awesome” and "amazing." As of last month, residents of the Mile High City can do more than vent online – they can ask officials to get rid of the horse. In Denver, public art generally stays in place for five years before the city’s Commission on Cultural Affairs considers any requests to remove it, said Ginger White, a spokeswoman for the panel. The waiting period is designed to give new installations the chance to grow on people. For “Mustang,” that window ended on Feb. 11, meaning it’s now eligible to be removed. But so far, the Denver Commission on Cultural Affairs has not received any requests to get rid of the sculpture, White told NBC News. There are no plans to discuss the horse at the group's monthly meeting on Tuesday. For the commission to take action, a petitioner would have to demonstrate “extreme adverse public reaction” over an extended period of time, White said. Officials doubt that will happen. “Mustang” will most likely stay, said Denver International spokeswoman Laura Coale, calling it an iconic piece for the area. In a recent survey, travelers cited the statue as one of the airport’s most memorable features, second only to its famous tent roof, she said. But she acknowledged not everyone is a fan. Count Denver real estate agent Rachel Hultin in the “don’t like” camp. Hultin – who once launched a Facebook page titled “DIA's Heinous Blue Mustang Has Got to Go” -- calls the piece interesting but not a good fit for its location. As travelers drive to the airport, they go by the horse quickly and glimpse it for only a few seconds so they don’t get the chance to learn more about it. "It's a really aggressive piece of art and if you’re going to do that as a gateway piece of art for your international airport, you need to have interpretive information or let people at least develop a relationship with it," she told NBC News. Like many critics, she finds the statue’s glowing red eyes “demonic” and menacing, especially at night. But Coale said this feature is actually the artist’s tribute to his father, who was a neon sign maker. Public objection to the sculpture seems to have calmed down considerably, Hultin observed, and even though she still thinks it doesn’t belong at the airport, she won’t petition the city to move it. Meanwhile, The Denver Post expressed hope the horse would stay put, praising it as a symbol of the region's historical and cultural heritage. "The sculpture is — in the true sense of the word — remarkable," the newspaper declared in an editorial last month. "'Mustang' is a sort of bizarro Mr. Ed in that it's a horse that gets people unexpectedly talking — about art."